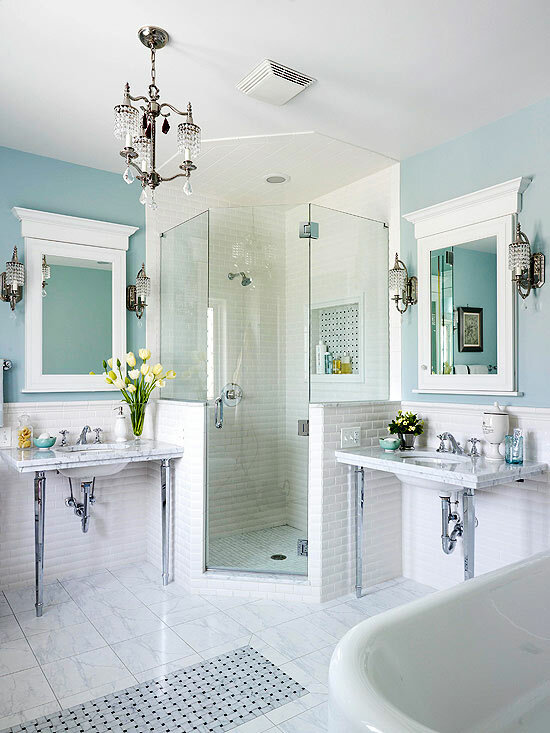 There is something about a wonderful bathroom. You can shut the door and escape, even if it’s just for a short while. If you're one for rituals, undoubtedly a couple of yours take place there. For me it's a space where it's okay for me to say, "No, you can't come in," and enjoy some privacy and personal space. There is nothing like a bath, candlelight, and a good book. Through and through I am a fan of white interiors, but there is something so luxurious about a small room painted in such a rich color. My tiny kitchen is navy blue and it makes it feel more expensive than it really is. And that chandelier! To me, anytime there is upholstery in the bathroom it feels elegant to me. I have a weakness for leaded glass windows or anything that looks like leaded glass. What do you think of the prints hanging over the window molding? The master bath in our new home has dual sinks, and I cannot wait! Finally sweetums and I won't be dancing around the sink both trying to brush our teeth at the same time! That black tile is so gorgeous. And the simple glass shower guard doesn't disrupt from the view. I also LOVE having a window in the shower! I could never have a rain showerhead though, because I don't wash my hair every time I get in the shower. I would prefer to see just one tile size used here, but the vanity top is perfect. Even if you don't have a fancy glass or walk in shower, a lux shower curtain or an ottoman or chair can add a glamorous touch. The pop of color from the rug is cute, too. 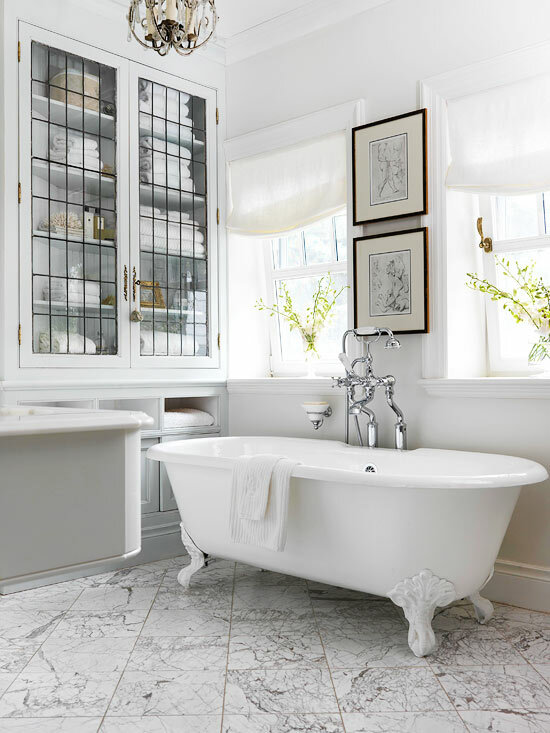 Do you have any tricks to make your bathroom feel more glamorous or restful?